This technique applies to all cameras although it has a great deal of relevance here as by using digital media, we are eliminating one of the steps - that of inputting the data using a scanner. If you can get far enough away from an object to be able to fit it all in then fair enough but there are times when you cannot, or if you are taking something that is far too big. This method uses the barrel distortion that wide angle photographs produce to give you a representation in two dimensions of a three dimensional object which itself is a lie. On the right, you can see a representation of a camera pointing at an arbitrary plane. You can take it either that you are looking from the side or from above. In this example, we shall use it as though we are looking from the side and creating an image of something that is tall - the yellow tower in the diagram. If you look at the composite on the right, you can see that at the bottom, we use the whole shot. Above that, we have used the image from the top, down to a point that corresponds to the cyan blob in the diagram above - the point in the imaginary plane (the imaginary object plane in the image that is, not the imaginary plane that involves complex numbers and the square roots of negative numbers) where the upper image intersects with the one below such that just over half of the upper image is used. The final image is made up from quite a few more images than just those on the right but this illustrates the point. On the right is the final image of Derby's Guildhall clock tower which is made from sandstoone. If you click on it, the image within a window will open up in a new browser. You will be able to scroll through the image or click on a link that shows the the full image. You might notice that there is some faint cloud on the left of the clock tower that appears to be the same as some near to it. This illustrates one of the problems of taking multiple images in that if there is movement, it might show up. At the bottom, this is countered by having the portion with people in it taken in one go. 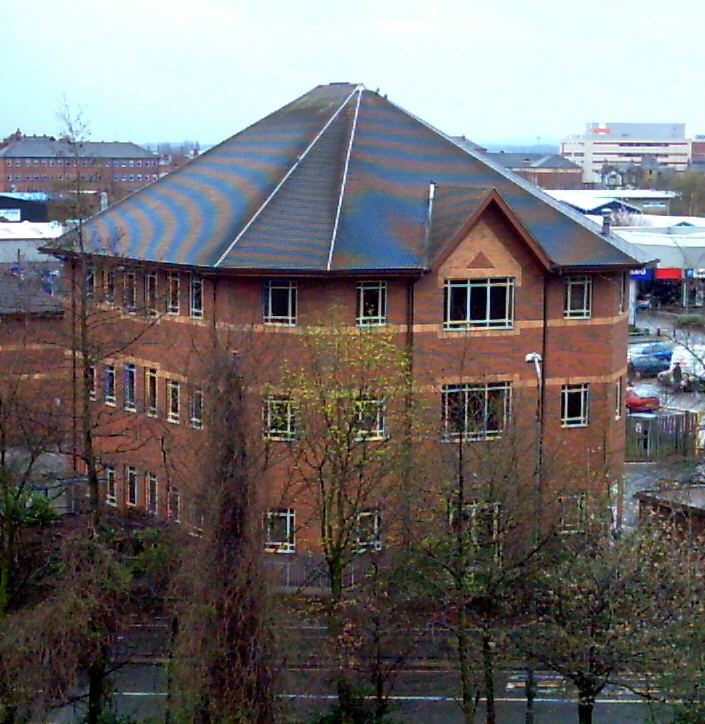 This is the same technique with the clock tower on Derby's Central Library which is south-facing, red brick and sandstone and was taken in overcast conditions. Note that the luminosity correction is different for each of the images. In the Library picture, the correction process started with the image at the bottom whereas with the Guildhall picture, the correction started with the image of the top of the clock tower. Here is something else to be aware of. A friend of mine told me that in the days of the school photograph being taken by one of the proper, rotating cameras, one trick that some children got up to was to take advantage of the fact that the image took a few seconds to take. Once the camera had taken them at the beginning end of the image capture, they would get off their chair and go and get onto an empty chair at the other end which was of course, only a few yards away. This meant that they would appear twice in the school photograph, once at each end. Here, the same can happen by accident if you are taking a panoramic 360 degree shot composite and somebody or something (it could be a vehicle such as a milk float, dust cart, rare vehicle such as a traction engine or the mayor's car and so on) happens to do the same as the child in the school photograph. If you have a digital camera, you have the freedom to take photographs of everything in full knowledge that you are not wasting any film that will then cost a lot to develop. However, there are some things that will take good photographs and some things that will generate their own problems. 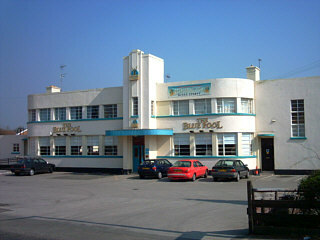 One thing that Derby is famous for is its 1930's Art Deco buildings. It has the only art Deco bus station in the country and throughout the city there are good examples of this architecture. However, one problem that it has regarding taking digital photographs is the thin horizontal window bars. These can be small enough; and, are certainly of high enough contrast to cause problems with Moire fringe-type effects and in the picrure on the right, they are in reality, painted white. These effects are partly down to the size of the cells that capture the light to make up the image and partly due to the way that the CCD obtains its colour information. With the exception of one type of digital image capturing chip where all three colour values are captured in each cell, they all use what is known as the Bayer patten, named after its inventor, a Doctor Bayer who worked for Kodak. As you can see, the cells are grouped into 2x2 blocks with two green, one red and one blue cell. This means that if you are trying to find the level of green in a blue cell, you cannot do it directly - you have to interpolate the values of adjacent cells. If you take our blue cell, to find the level of red in it, you can take the average of the four surrounding red cells, repeating the process for the green value. However, if you want to find the level of blue or red in a green cell, you only have half of the information to go on. In fact, if you look at it, you will notice that every other row or column has no red cells and the same goes for those in between with regard to blue cells. 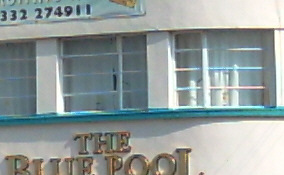 Another problem is that if you have, say, a horizontal structure that has a sharp contrast (for example the 1930's window bar in the Art Deco building), you can find that you get the colour fringing based upon the arbitrary nature of where the contrast feature happens to fall on the CCD. One attempt to get around this is to use algorithms that look at the horizontal and vertical pairs, looking for the best correlation and using the most appropriate pair to determine the average level for any particular colour but in the end, you cannot get around the fact that two thirds of the information has been thrown away by having primary colour filters over the cells in the CCD. Even the use of secondary colours instead still has the problem of lack of information because instead of presenting the cell with the transmission profile of a primary colour, instead, it is with the absorption profile so there is no more data. However, the use of secondary colours does mean that more light gets through and therefore these have better signal to noise ratios and speeds. In the files section on the SuperDisc, I have included two Bayer patterns - primary and secondary - so that you can experiment for yourselves. Another effect is that of Moire fringes. In the image on the right, I have saturated the colour of the right hand half and you can see the Moire fringe interference pattern between the tiles on the roof and the cells in the CCD. If you click on the image, you will get a full version open up in a new browser and you will be able to see other Moire fringes. Whilst these might seem nothing more than an irritation, they can have their uses. If the two patterns that are interfering are uniform, the pattern will be uniform - if there are odd angles involved, there might be curious angles produced but everything will be uniform. If there is a distortion, you will see irregular curves formed and as we know that the CCD's contribution to the pattern is regular, the psychedelic pattern on the roof must be down to distortions in either/both the way that the tiles are laid or/and any distortion of the roof plane from flat. You can see that where the roof is fairly narrow - in the top halves, the patterns are fairly straight whereas in the bottom half, it is distorted presumably due to the weight of the roof as in the left-facing face or due to structural roof features as in the right-facing face. 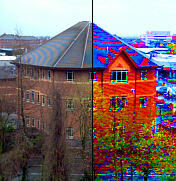 If you turn up the colour saturation in your favourite image editor, you can even see how even the brickwork is. If you have not got your own domain name, there are sites that will let you add your own choice in front of a variety of ther own - working your way down the DNS tree. One such site is DynDNS.org http://www.dyndns.org/ which will let you have five free domain names (as long as nobody else has got there first). 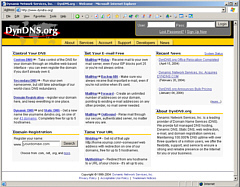 DynDNS offeres a dynamic and static service. The static service offers the same as the dynamic one except that it is for people whose IP address stays the same. If your IP does change with the static service, you can change it to the new IP address although this can take a few days to filter through the system. For the purposes of this HelpDesk Extra, I have created a number of URLs from info2.mine.nu using the wildcard attribute at DynDNS. So, as *.info2.mine.nu is being directed at my IP address, I can (and have) set up virtual hosts for: http://www.info2.mine.nu/ , http://www.pauls.info2.mine.nu/ and http://clear-the-drains.info2.mine.nu/ which all run off one server. below gives you some extra information on how to create and check this over what is in the magazine. ...you let the server know about other websites you want to run of the server. defines the server admin contact details if you want that to be different for each vhost. If, for example, you wanted to have mail go to somebody completely different, somewhere else on the planet. These tell the server where to serve the files from. There is a difference in interpretation between the two but if you include both, you are covering yourself. This is the access log and you can define the format for it here as well - it need not be the same as the other logs, as long as the form is defined in the rest of the httpd.conf file so that Apache knows what you are talking about. It pays to be standard though as this makes it easier for server stats programs such as Webalizer to understand it. Also, being a log file for just one server, you can look at how people navigate through your sites individually. You can carry on defining as many hosts as you like as long as you have the memory and disk space to do so. One advantage that Linux has over Windows is that if you decide to increase the amount of disk space that is available in a certain area, you can do it just by mounting it there. In the tree on the right, you can see that the /srv directory is one partition but mounted within that is another partition called hcam. This is configured in the fstab file in /etc. In this case, it is an smb mount from another machine but there is no reason why you cannot use it to mount another drive (just imagine what you could to with 250GB of web space) that is physically in the same machine. Being able to do this has the effect of not necessarily requiring you to change your httpd.conf file in order to accommodate this (if, for example it was part of an existing website). You must remember that you should protect your servers with at least a firewall and preferably, it should run on a machine on its own. One little problem you will have is that unless you start messing around with your DNS on your LAN, you will probably not be able to see your virtual sites from the Internet. One solution to his is to use a proxy so that your browser connects to the proxy and the proxy connects back to your site. Whilst this can be achieved without graphics by asking Google to translate a site for you, there are some sites that are set up to allow anonymous browsing but can be used to check your site's virtual websites. 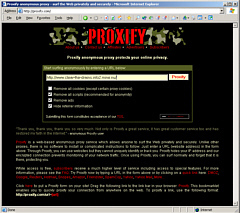 One of these is Proxify ( http://proxify.com/ ) and it will let you see your images so, if you have forgotten to make them readable to others, their failure to appear will be seen by doing this. Remember though that if you want to test out password access, you should set up a temporary password for the purpose and delete it (or configure it out) afterwards.